This guide will explain the most important aspects when selecting a Gaming Desk and then provide our top picks for the best gaming computer desks you can find. Gaming usually involves a high amount of energy and focus. For every gamer, the best way to focus is to have a neat setup of all of their gear. Focus is greatly enhanced when all computer peripherals are rganized. Meanwhile, energy is saved when all computer accessories are n easy reach. 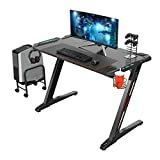 All of these lead to the proposition that it is essential for every gamer to invest on a good gaming desk if they want to achieve better gaming performance. Since gamers spend a lot of time in sitting and manipulating their desktops, it is also imperative that their posture must be considered. Bad posture often leads to back problems ad neck problems. This can’t only be solved by a mere ergonomic chair but also with a good desk that fit your needs. Listed below are five gaming desks which we think are the best in the market in terms of price, quality, and features. Below are our picks for the best gaming desks for budget, moderate, and pro gaming desk setups. Be sure to check out our Top PC Gaming Chair selections to get the perfect chair too! Before purchasing the best gaming desk for you, decide on the perfect size which can fit your desktop and computer peripherals. Make sure that that the space of the desk can keep all your accessories organized and fits inside your room. You can choose a variety of gaming desk shapes, such as rectangle, L-shaped, and U-shaped. The rectangular shape could provide drawers for storage while the L-shaped desks is intended for space-saving needs. On the other hand, U-shaped desks has the best space capacity. In buying for the best gaming desk for you, choose one that has great strength to hold all your computer desktop and peripherals. You can evaluate the strength of the desk by looking at its quality and materials used. The material used must be firm to support the weight of all computer accessories. Gaming desks offer various features, like CD racks, cabinets, and sliding keyboard container, hence it is advisable to know what features you need the most. For instance, if you want to keep your keyboard in a sliding container, then choose the best gaming desk which offers a sliding keyboard tray feature. You can collect cables and extension cords on the shelf under the table top, so they're hidden but still close at hand. Large height adjustment range of 28" to 46.5"
Standard lifting capacity of 200 lbs. A good gaming desk must have a great ergonomic design that protects your health from possible health risks that go with long-term gaming activities. Such possible health risks include carpal tunnel syndrome, back pain, and neck strain. To avoid these health risks, look for a good desk that have a good height measurement which can ease your arms in reaching the keyboard and mouse. A perfect gaming desk should have adequate space to promote better gaming convenience. It must enable you to do simple multitasking tasks without leaving your chair. All things must be at arm’s length. Look for a good gaming desk that can last for a long time. Its structure and type of material must stand the weight of the computer peripherals. There are various forms of materials included in the production of desks, such as wood, glass, and PVC. The most preferred material is wood, but it can be a bit heavy. Most large desktops require complex procedures in assembling parts. This takes time and energy. If you don’t have the knack and patience in assembling complicated parts, look for smaller desks. Remember, the best computer desk for you is the one that fits all of your requirements and gaming setup needs. The Origami RDE-01 is a foldable computer desk which you can store easily in less than a minute. Its 2-part structure eases out the weight in moving it around the room. More importantly, it is sturdy enough for daily gaming experience. This item is equipped with features that heighten its simplicity and comfort. Simply put the tabletop above the open frame, and you can have a great desk for your gaming accessories. This feature gives ease in moving the item conveniently around the house. The tabletop is made with particle wood, which offers a conventional and lightweight design. Through this feature, you can flatly fold the item for more storage convenience and place it anywhere in your room. To keep it more secure, dual locks are provided. This allows enough space for a complete set of desktop and accessories. This desk’s shelf capacity is 250-lb per shelf on balanced surface or 75-lb per shelf on wheels. This allows an adequate capacity to hold heavy accessories on top of the table. This product comes preassembled, hence there is no need to assemble its metal structure. You only need to open the metal frame and put the removable tabletop to start using it as a computer desk. 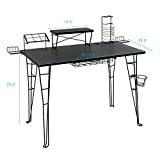 Among all computer desks available in the market right now, this item belongs to the low-cost bracket. This makes it ideal for those who have meager budgets, yet still want to enjoy the functionality of a computer desk. The item allows you to store it easily by simply folding its metal frame flatly. You can also move it easily around the house. This is a great benefit if you are aiming for convenience and portability. A small number of customers have issues regarding the item’s locking mechanism which tends to fail over time. This could happen if you handle your item with a lack of care. Since this is not a common problem among users, the item is still revered by many. If you look for an affordable and portable gaming desk, then this product is for you. Its design is made for easy storage and its capacity is adequate to handle your complete set of gaming desktop and peripherals. Considering its price, this is a great purchase for budget conscious customers. The Walker Edison desk comes in an L-shaped style which offers a corner block for additional space. Its glass design gives a sleek and elegant design. Moreover, it is unrestrained by giving extra shelves for compact storage. This item offers two rectangular desktops and a quarter-round shaped desktop. When combined, they form an L-shape style that provides a generous surface area for all gaming peripherals and monitors. The table top of the desk is made from safety glass which offers a sleek design to the whole computer desk. It emphasizes the desk’s neatness and simple design. This feature allows you to place your CPU securely under the desk. The desk’s corners are securely designed to enclose the CPU steadfastly. A keyboard tray is also provided to store your keyboard in place. It can be installed underneath in ether section of the desk. The entire desk is supported by a strong base made with a steel frame. It is glossed with a powder coat finish. The glass top of the desk brings sophistication to the design of the computer desk. It gives off a clean finish which emphasizes the simplicity and neatness of the desk. 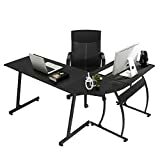 This item comes with a CPU stand and keyboard tray that offers storage to these important computer peripherals, This gives more convenience to to the desk’s functional design. With this advantage, you can already type in your desktop with great ease. The L-shaped style of the desk gives more room for other computer peripherals and table ornaments. With this space-saving design, you can place this in any corner of the office or room. A few users have complained that their glass top has easily broken into pieces. This could happen if you don’t handle it with care. Nonetheless, this product has satisfied majority of its customers. This item is a perfect addition to any room which searches for an elegant looking gaming desk. This is not limited for functionality alone, but it also offers a great space-saving benefit by giving you a neat organization of computer accessories through its extra shelves for keyboard and CPU. 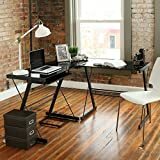 This is definitely a good option if you are looking for the most popular, best computer desk. The Altra Dakota L-shaped desk is a great space-saving furniture that fits nicely in any limited space. It has a large surface area that can accommodate ample room for your gaming monitor, accessories, and other decorations. Moreover, it is built with many shelves for extra storage. This desk weighs around 70 pounds and is finished with either a black ebony ash or dark russet cherry colors. It is made with features that give more functionality and storage rooms than any regular desk in the market. This feature allows you to manage your cords well. This keep the cords organized and prevents anyone from getting entangled with them. 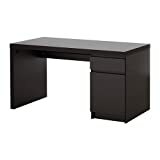 This particular features makes the desk adequately capable to hold your computer desktop and all other office accessories. This shelves are crafted with an open design which makes it easy to store and access important papers and books. This item is designed with an L-shape form which saves space in a tiny room. Simply place this in any corner of the room and you can make great use of a limited room space. Also, it provides more space for other accessories other than the computer monitor to be placed in the desk with its added shelves. The grommets installed give a neat design to the desk as cords are properly keep away from entangling other accessories. Its open shelves also keeps the papers and books in store below the desk. The black and dark cherry colors of the desk effectively conceal the appearance of dust. This product is cheap enough to fit to any budget. This makes this a great purchase given its generous features. Some customers have problems assembling this desk because it comes with no instructions when it arrived in their homes. You can ask help from others if you find it difficult to assemble this item. Despite this downside, majority of its users have great satisfaction with its other features, like grommets and shelves. This item is an ideal choice if you want a cheap organizer of your gaming monitors and supplies. This comes with great features, hence this desk offers a great value of your money. If you have a limited room space, this L-shaped desk is a perfect addition to your room decor. This Best Choice Products desk comes in an L-shaped form which gives more surface area and room space. It gives a classic look with its pure wooden table surface. 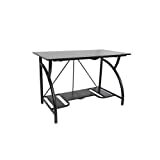 Its sturdy frame greatly supports all your gaming essentials situated on top of the desk. This item is built with features that makes it one of the best gaming desk in the market. Its L-shape structure gives you more room for additional monitors. The keyboard tray allows you to access your keyboard at arms length. The CPU stand underneath the desk keeps the CPU in place. These 2 shelves gives more surface space for other gaming essentials on the table. This feature allows the desk to support its weight effectively. It is structured in a unique architecture design which gives a strong base of the table. This offers a classy contemporary appearance of the entire desk. It also gives sturdiness to the entire desk design. This item is made with wood and metal frame which are proven to be sturdy materials to last for a long time. The metal frame is designed durably to support all heavy loads of gaming essentials. Meanwhile, the wood table gives a good contact surface for all gaming monitors and peripherals. The wooden table gives a nice design to the desk. On the other hand, its metal frame gives a modern design. Together, the desk gives off a mix of classic and modern design which is attractive to look. 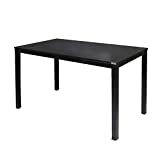 The 2 connecting tables that form the L-shape desk provide more space for other gaming monitor and peripherals. The 2 shelves provided for keyboard and CPU greatly enhances the surface area of the table because it leaves much room for an additional monitor on the other section of the table. Some customers complained that drilling the holes of the pieces together is difficult because some are misaligned. This could be remedied with a help of another person. Nonetheless, this item design has greatly satisfied most of the users. This product is a great purchase for those gamers who want more surface area for another gaming monitor and other peripherals. Its keyboard tray makes it easy to store the keyboard when not in use. The wooden table adds sturdiness and a classic design for the whole desk. This is definitely a great option if you seek for more surface area in a limited room space. We thought we would throw in a stand up option just incase anyone would be interested. The X-Elite Pro can instantly change from a sitting to standing desk through its adjustable height feature that can adjust from 5-16 inches. Like any good standing desk, this item offers back pain relief, especially if you’re tired from doing games while sitting. This already comes preassembled which allows you to use it in an instant. The features of this item are designed to give an ergonomic convenience to its users. Simply let it stand on any compatible desk, and you can instantly experience a standing desk for yourself. With this feature you can adjust the height of the desk from 5-16 inches. This makes it amenable to different heights of customers. This is sufficient enough to accommodate a moderate sized desktop and keyboard. This item can hold a maximum of 20 pounds. This is adequate enough to hold a medium weight desktop and keyboard. This item arrives preassembled already, so you no longer need to invest on too much time in assembling some complicated parts. Simply place this on top of any compatible desk and you can move its height either for standing or sitting positions. This item only weighs 27 pounds which is very light to carry and move to any desk you want. This adds more portability and convenience to the product. The height of this item can be adjusted easily from 5-16 inches. No matter what your height is, you can adjust the X-Elite Pro according to your preference. A small rate of customers has complained about the steadiness of the desk. They have found that the desk tends to shake when they use the keyboard. This could be the case if you place it in an uneven or shiny surface. Nevertheless, most of the users have expressed their admiration on the product. This item is ideal for those who also prefer a standing desk aside from a sitting gaming desk. Its adjustable height feature makes this possible to move to both positions easily in just a few seconds. This kind of standing desk offers back pain relief which is contributed by sitting for a long time. Hence, this standing desk is not only functional but also offers health benefits for gamers. Out of the over 150 million Americans who play video games, only serious gamers realize that every part of the gaming experience is important. Gaming desks are the base of your activity with the controls in your hands. A great desk can make the difference in those final minutes before achieving your goal. On the other hand, a bad desk could limit your abilities when you need them most. kinds of desks. Here are the most important factors to consider. Before you go looking for desks, you need to ask yourself about money. How much are you willing to spend on a desk? The most expensive gaming desks can cost hundreds, and maybe even thousands of dollars. If you are in that price range, there is a world of opportunity in front of you. Some of the desks with the best overall rating cost just under three hundred dollars. Still, it’s possible to get a quality desk for less than a hundred dollars. Before jumping ahead to other traits, you should think about your range. Then you can think about exactly how it will fit into your room. Size is a no-brainer when it comes to picking gaming desks. If it fits, great! If you can’t even get it into your room, you’ll need to send it back. Despite how simple that sounds, it’s easy to make a mistake when figuring the width and length of your desk. It’s possible you might forget. To be sure, take out a tape measurer and determine the dimensions of the space that you will put your desk in. That way, you will be able to whittle down your options. That will make picking among different desks even easier. Those dimensions will help you answer your next important feature question. Gamers desks come in all shapes and sizes. Some popular desks like the Arozzi Arena have a rectangle shape and a small inlet for you and your chair. Others are meant to fit on a corner. Many are a combination that will only work in some rooms. It’s important for you to know what kind of shape will work best for your room. Take a second to envision the desk in a place where it fits best. Once you have done this, you are one step further toward picking the best desk for you. Then it’s time to get even more specific. The look of gaming desks is definitely important. You want the desk to look a way that makes you feel comfortable showing it off. But you shouldn’t sacrifice functionality for that look. It’s important to consider the space your machines will need to ventilate as they heat up late in battles and missions. Your desk will hold a lot of equipment that fuels your gaming experience. On the surface of your desk, much of the basic equipment will hold a spot. That includes your monitor, among other components you should choose. Take a second to consider if you desk will store other equipment. Where will the console go? Do you need to put any wires out of sight so they don’t get in the way? If so, you should consider buying a desk with drawer space. These desks are perfect for someone with a lot of gaming equipment. Because, as you know, there are a whole lot of games to play out there. The great number of games available to play means you have to be light on your toes, ready to change things up. As you work down the list of the best video games ever, or maybe the more popular ones, you will find that different angles work best. How do you switch things up? You can take on this issue in two ways. One is to buy a chair that has adjustable height. With the right chair, you will be freer to move around as you see fit. But an even better solution includes a desk with adjustable height. A desk with an adjustable height will make things easier on your neck when you need to look up more than usual. Or if you just want to switch things up. Because you should be planning to spend a long time at your desk. Gaming desks are meant to be used quite a bit. That means your desk should make your long term experience as good as possible. Some desks are designed for the comfort of the seat. You should look for a desk that encourages good posture and helps you avoid back pain in the long run. Good gaming desks can help you avoid the world of chiropractors and physical therapists. That will let you focus on the outer qualities of your desk. Your desk will be a part of your room, and you should want it to fit in. There is a wide range of materials that gaming desks are made out of. These include wood, glass and everything in between. What color do you want your desk to be? What texture do you want it to have? Besides that basic question, you should also remember that desks can get big. You might not order a concrete desk, but other materials can be hard to carry. The task of getting your desk into your house and in the right room is only the first part. Of course, when you press “click” to purchase gaming desks, there is one step that happens before it looks like it did in the photo. You need to get that desk together! The assembly process might be easy for some gamer folks. After all, hand-eye coordination is a necessary skill in both gaming and construction. Still, if you’re constructing it by yourself, you should look closely at your gamer desk before purchase. That will allow you to be sure that it’s not too heavy or complicated for you to do. Now, you are more prepared than ever before to navigate the world of gaming desks. With the right traits in mind, you will end up with a desk that will improve your gameplay. Continue reading for the best information on all things gaming. computerdeskguru.com is a participant in the Amazon Services LLC Associates Program, an affiliate advertising program designed to provide a means for sites to earn advertising fees by advertising and linking to Amazon.com.